I love making tile-top projects. However I’m pretty miserable at making grout correctly. 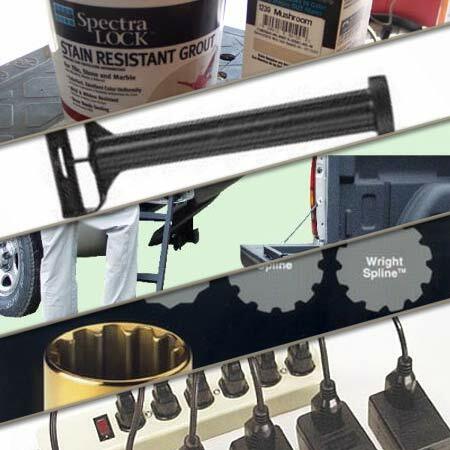 Maybe I don’t measure right, or I mix at the wrong intervals, but it always seems to go south by the time I’m through — always, that is, until I tried the SpectraLock grout system about two years ago. Since then I’ve never had a problem with grouting tile, and it involves a great deal less swearing. Special projects often involve loading and unloading a lot of stuff from the back of the shop truck, and a tailgate ladder can make the whole process more pleasant. This one’s side-mount position caught my eye — powder-coated and rated at 300 pounds, it should be durable and sturdy enough for most one-man jobs. LOX screws are so strip-proof, you’d practically have to take a drill bit to ‘em to ruin ‘em. The same goes for spline bolts — good luck stripping them — plus many spline wrenches are “backwards compatible” with hex, twelve-point, female Torx, and square-heads, and they’re more effective at turning 50% rounded fasteners. Now the Wright Spline takes another step. Sure, you could drop the money on a new Power Squid, but if you already own serviceable power strips with a few blocked outlets, why not just buy a few Power Strip Liberator cables from Ziotek? They’re not just for power strips — you probably have a few regular outlets blocked by power adapters somewhere in your house or shop.